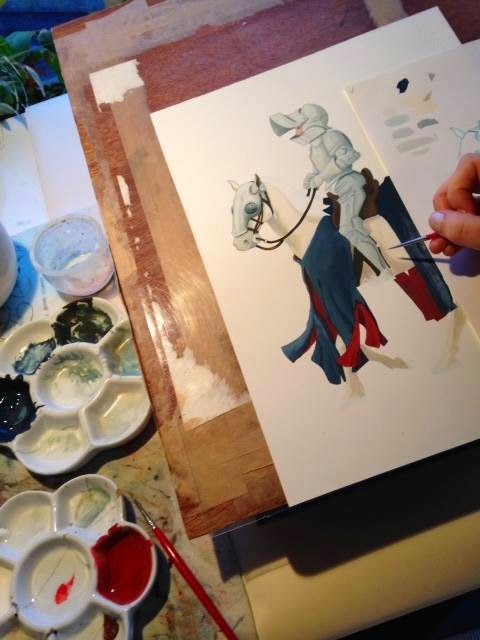 My daughter Alice has been working on the art work for my website, here's how she is getting on. "I’ve recently been working on a project with my dear mum to paint our ancestors for her family history website. From coal miners and fisherman to knights and kings, our history has taken us all over Britain and it’s been fascinating to imagine their lives as I apply each paint stroke. To find out more about what I have been up to so far this year, just head over to my blog…"
And here is where these beautiful illustrations are destined. 'Richard that was sonne to Richard Dewke of Yorke & brother unto Kyng Edward the iiiith, was kyng after hys brother & raynyd ii yeres & lyth buryd at Lecitor, lies buried at Leicester. 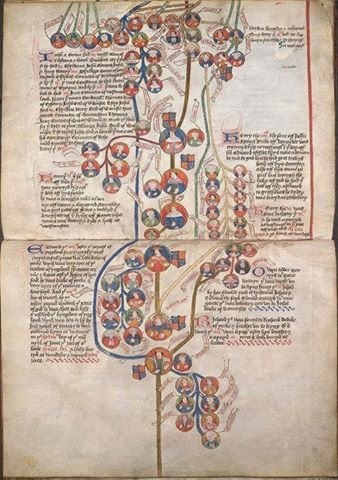 Richard's connection to his Plantagenet ancestors is in yellow and Henry VII royal blue line neatly attaches itself to the royal family of Edward III and then all the way back to Adam and Eve. 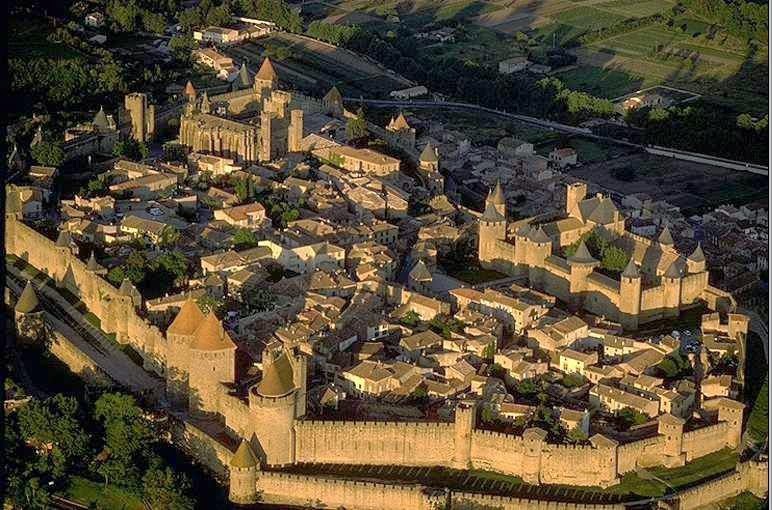 The Medieval city of Carcassonne in France has an extraordinary system of ramparts surrounding its castle and houses. At the beginning of the 19th century, the city was a fortress with half-ruined walls, perched on a steep isolated hill, but before that it was a pre Roman fortified settlement. It was only in the second half of the 19th century that it benefited from one of the most extensive restoration projects ever attempted. The impressive fortifications are composed of two enclosures and a twelth century castle, itself surrounded by fortifications. These fortifications extend over a total length of a mile and a half. The city, which these walls protect have over fifty towers, and the homes within are still inhabited. Once the centre of the power of the Kings of France it was under the successive reigns of Louis IX, Philip the Bold and Philip the Fair that it became what we see today. There are two main entrances to the city, the Narbonne Gate on the east façade and the Aude Gate on the west façade. It has been said about Carcassonne that the 'dreamlike atmosphere' makes it an ideal setting for passionate medieval tales. Carcassonne was listed as a World Heritage site by Unesco in 1997. Mini History Blogs Thomas Cromwell, How do you pronounce his name? The National Archives hold a number of documents that supports Hilary Mantel’s 'well-researched facts' that are featured in both her books Wolf Hall and Bring Up the Bodies. If you are watching the series you may have noticed that Thomas Cromwell is often referred to as ‘Cremuel’ or 'Crumwell.' As the National Archives points out Mantel has got this absolutely correct and you can see this in the receipt for payment to a Florentine sculptor. "In episode 1 (Three Card Trick) of the BBC’s Wolf Hall, we saw Anne Boleyn playing with Cromwell’s name, pronouncing it as ‘Cremuel’, with a French accent. We can actually find examples of this exact spelling by French and Italian correspondents in the State Papers. 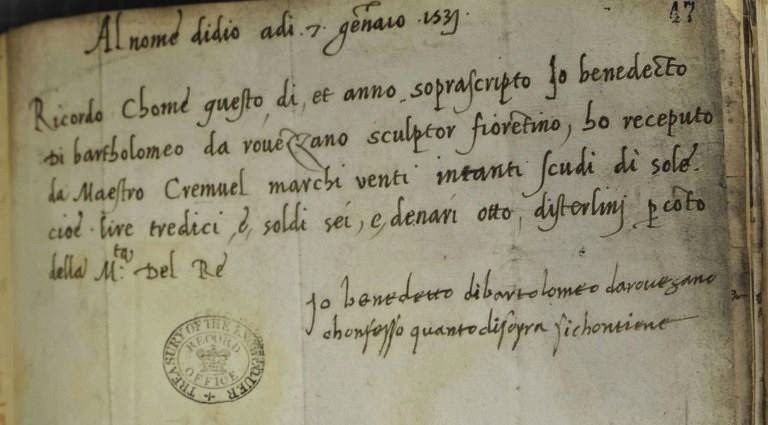 The Spanish ambassador, Eustace Chapuys, is known to have spelled Cromwell’s name thus in correspondence to the Emperor Charles V and an Italian sculptor recorded this spelling in his receipt for a payment made to him on the King’s account by Cromwell "
Ruth Selman's articale for the National Archives makes interesting reading. Montacute house, seen here, was featured in last nights episode of Wolf Hall It represents Greenwich Palace on the 24th January 1536. It was at Greenwich Palace that Henry VIII was thought to be fatally injured after being crushed when the armoured horse he was riding landed on him following a fall. 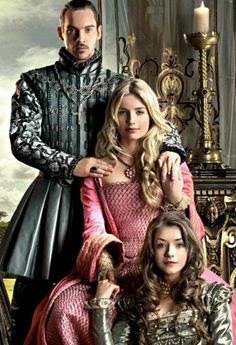 The accident occurred at a tournament when Henry was forty-four years old, it ended his jousting career, aggravated serious leg problems which plagued him for the rest of his life, and is thought to have been the reason Ann Boleyn miscarried leading to her later downfall. 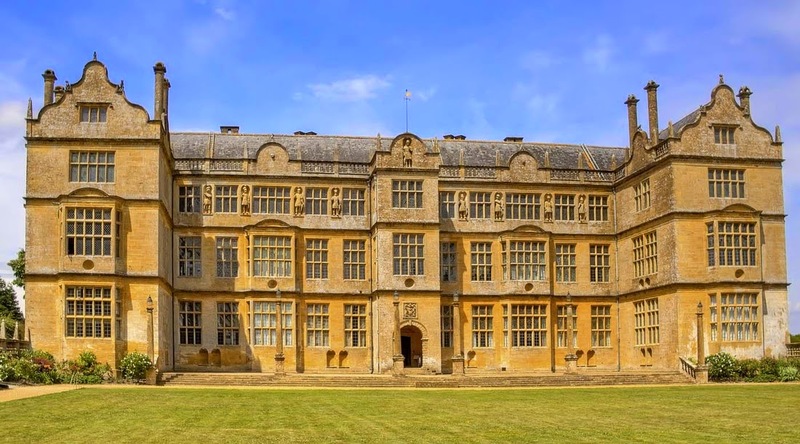 Filming for Wolf Hall took place at a number of National Trust properties, Montacute House being one of them also one of my favourite places Lacock Abbey and Penshurst Place. 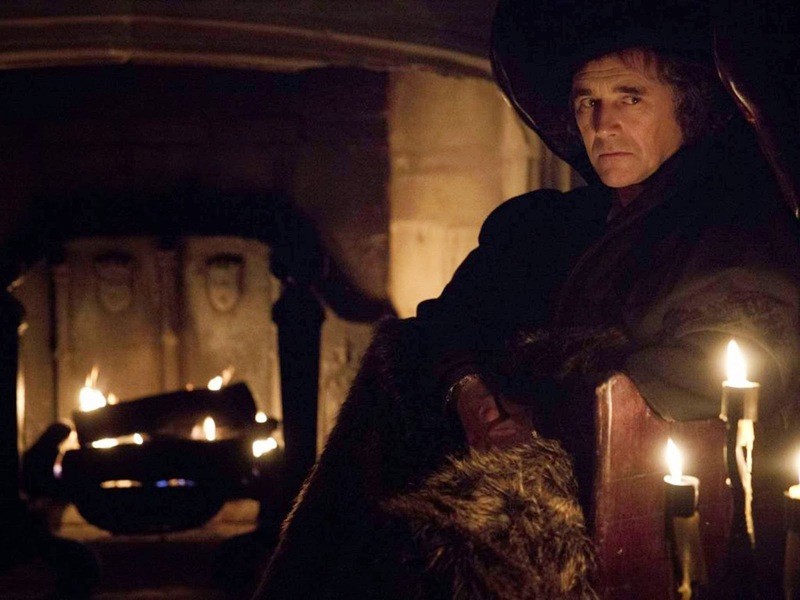 I have added a link so you all can see where all Wolf Hall locations properties are situated. I wonder what Sir Thomas Vaughan was thinking when he was forced down these steps over five hundred years ago? Thomas Vaughan was the second husband of 13x great grandmother. He was executed at the castle in the June of 1483. A Yorkist by inclination, he was riding between Ludlow Castle and London accompanying Edward IV son to the capital for his coronation when he was arrested. 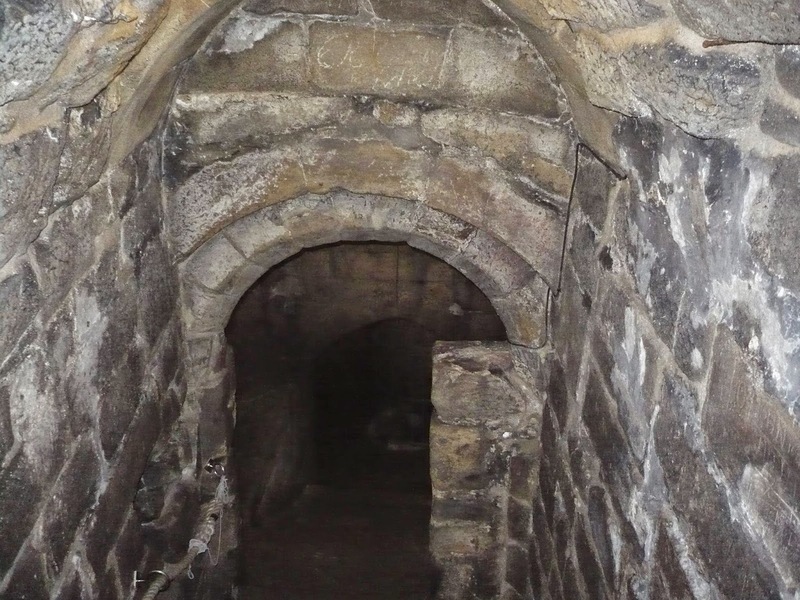 Vaughan was executed here at Pontefract Castle on the order of Richard Duke of Gloucester, later King Richard III. Not one of Richard's greatest moments I'm afraid. In the image we can see John Everett Millais's work entitled For the Squire, which was exhibited at the Grosvenor Gallery in 1883 and follows the tradition of 'winsome and picturesque girls' Millais produced in the late 1870's and 1880's. 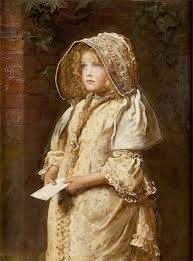 This genre, which included Cherry Ripe, Une Grande Dame and The Nest, Millais used his own daughter, friends or professional models as sitters, but for this particular image the child is not known. Here we see a rosy cheeked, dewy eyed county girl, as she waits to deliver a letter to the unseen squire. The child looks quite calm considering the landholding gentry were viewed as as symbols of authority and often feared by the tenant/farming community. Millais could be said to have been a true artistic prodigy, entering the Royal Academy school in 1840 and winning a gold medal there when he was only eighteen. At the Academy he became friendly with Holman Hunt, and the pair formed, with Dante Gabriel Rossetti and others, the famous group of artists known as the Pre-Raphaelite Brotherhood. One of the most successful and important artists of his time, Millais had many engravings of his work, including this one, sold around the world. 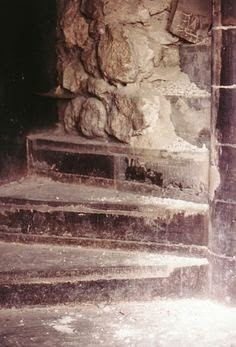 "The stairs in the White Tower where the bones of two boys were found and have been long thought to be the sons of Edward IV." If you'd killed these two young children would you bury them in the place where they died? How can you conceal the bodies, dig a hole big that is big enough the take them, (where do you put all the rubble from a huge hole) fill it in again and do all this when the Tower is filled with people? Whats your opinion on this theory? Historical Dramas...Like Them or Loath them? Of the new series to grace our screens, Wolf Hall, it has been said "fails to dazzle" its "dark, dull and boring" even "confusing." 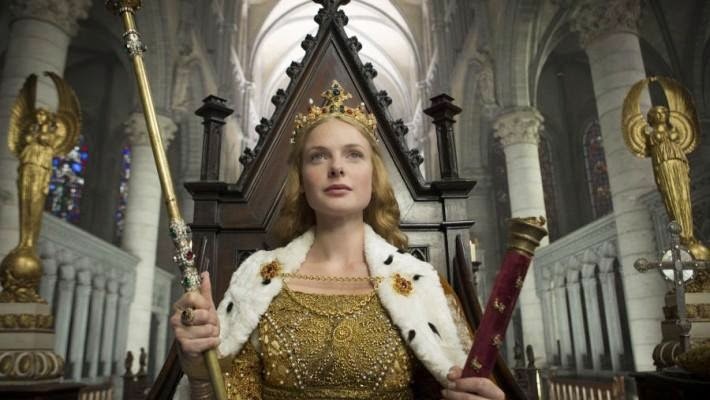 'Glamour' shows like The Tudors or the White Queen received equally scathing reviews, one critic writing no "slop-pots-'n'-rotten-teeth" and " far too clean and sparkly." We either want a stab a reality, were the characters look like their worlds about to end (it mostly does, quite horribly ) or we want glitzy, happy smiley people oblivious to the fact that the executioners busily sharping his axe just outside the window. We either want the angry, gammy legged, bloated but real Henry VIII or we want an appealing, ageless, pin up boy (I'll pass on both).....I am confused! In dramas, characters are either good or bad there seems to be no middle line. We are usually forced to admire More and dislike Cromwell or you admire Cromwell and dislike More. But with regard to both men I'm a pick and mix girl, admiring and disliking both men at the same time. The lives and the actions of historical characters must be viewed and options formed, not from dramas or fiction, but from within the time that they lived because this affected the choices they made, rightly or wrongly. In reality their lives were not a six part TV serial ! Like my grandmother used to say about television, if you don't like it, turn if off! The images below is a modern interpretation of the events leading up to Battle of Mortimer's Cross that forms part of a parchment held at the British Library. 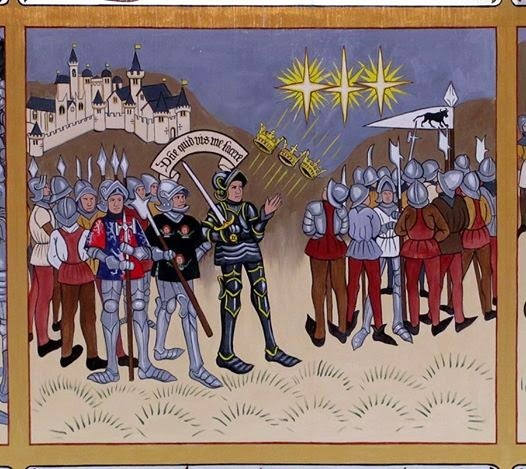 The original, dated between 1460 and 1470, is one of five pairs of miniatures "pairing an event of Edward's career with its biblical precedent " This part of the parchment is an allegorical representation of Edward's fulfilment of a prophecy witnessed the day before the battle, that is the sight, as mentioned yesterday, of three suns seen by Edward as the Holy Trinity and that God was on his side. "The battle of Mortimer's Cross was fought in the middle of winter, well outside the normal campaign season. It took place when the Yorkist army of Edward, Earl of March, intercepted a Lancastrian force under Jasper Tudor, Earl of Pembroke, that was marching into England from South Wales. On the 2nd February 1461 (though some sources claim the 3rd), somewhere near Mortimer’s Cross Edward deployed the Yorkist army, probably on ground of his choosing and engaged the enemy. They defeated the Lancastrian army, though we know nothing of the detail of the action, and a number of Tudor’s commanders, including Jasper’s father Owen, were captured and later executed in Hereford." 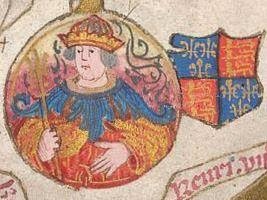 Was it a bright spot, like the one in the image, that appeared this day in 1461 that convinces Edward IV that he would win the forthcoming battle? 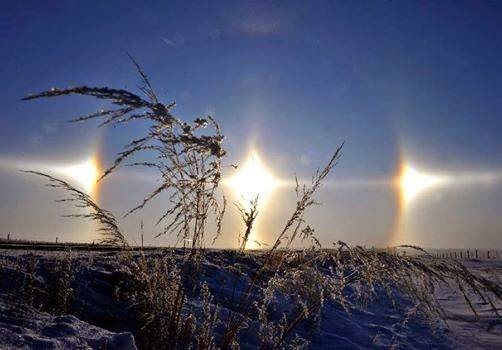 A sun spot or a Parhelion, sometimes appears on either side of the sun, giving the impression of a saintly halo. Edward thought it represented the Holy Trinity and that God was on his side. It is from this beautiful sight that Edward took his emblem....The Sun in Splendor. The Battle, that came to be known as Mortimer's Cross, took place on the following day, the 2nd of February 1461.